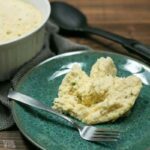 No need to miss pasta on a low carb eating plan. 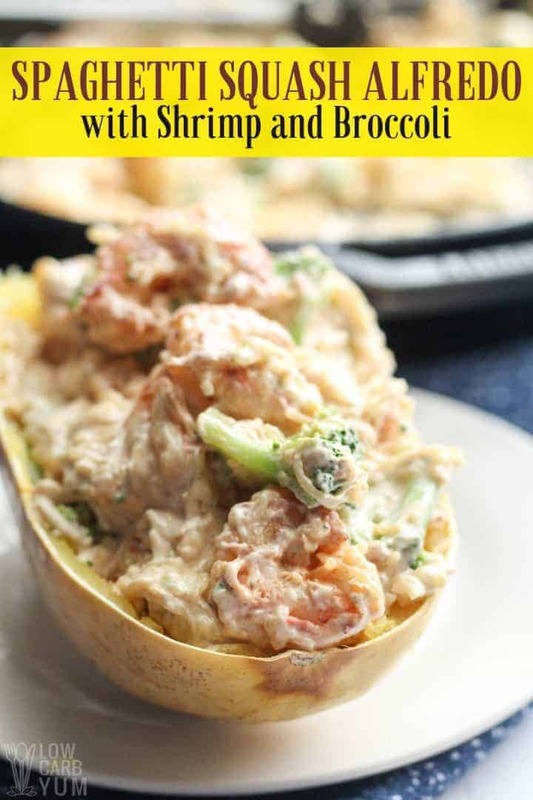 This shrimp spaghetti squash Alfredo with broccoli is quick and easy to prepare. 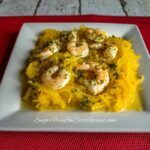 Even before going low carb, I was a huge fan of spaghetti squash. It just fascinated me that I could make an easy chicken tetrazzini casserole without using wheat based noodles. What was even more amazing is that after going low carb, I could still enjoy a Filipino pancit recipe similar to my father’s signature dish. I just replaced the standard rice noodles with spaghetti squash. 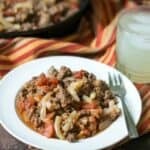 But the recipe I’m sharing today is something I loved ordering at a popular Italian restaurant my family would often go to. It’s a shrimp spaghetti squash Alfredo with broccoli. And the dish is much healthier without the wheat based fettuccine noodles. I cooked the spaghetti squash in the Instant Pot on high pressure. It’s my favorite method and it cooks up pretty fast under pressure. I also read the cooking squash in a pressure cooker breaks down the lectins making it easier to digest these plant proteins. But you can also cook spaghetti squash in a crock pot. For a richer Alfredo sauce, I’ll use heavy cream instead of water. But, there’s plenty of high fat dairy in the butter and cheeses. 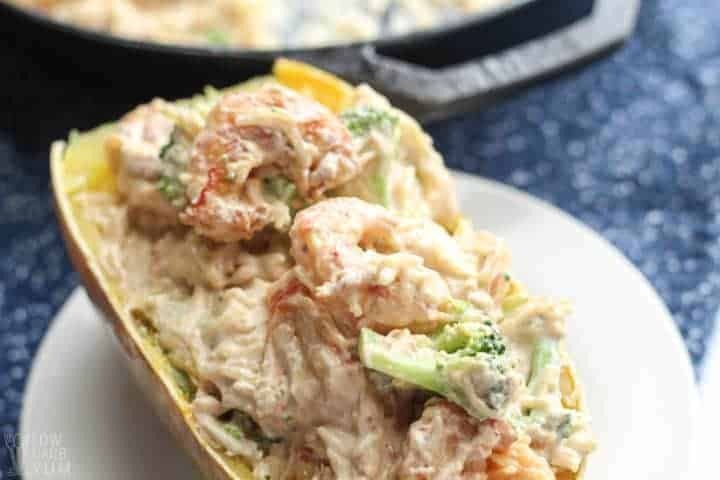 Pan fried shrimp, fresh steamed broccoli, and cooked spaghetti squash is blended into the creamy sauce to complete the dish. 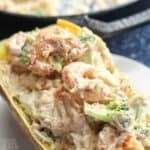 You don’t need a lot of time to make this simple low carb broccoli shrimp spaghetti squash Alfredo dish. It cooks up quickly in a skillet. I actually made this dish after coming home from a long 12 hour work day. To make things even easier, I used chopped frozen broccoli. My shrimp was pre-cooked too as it was leftover frozen cocktail shrimp. I just had to remove the tail ends. The shrimp is cooked in melted butter with garlic in a skillet over medium heat. If raw, the shrimp needs to be cooked until fully pink. I like to sear the shrimp to form a browned crust on the outside. 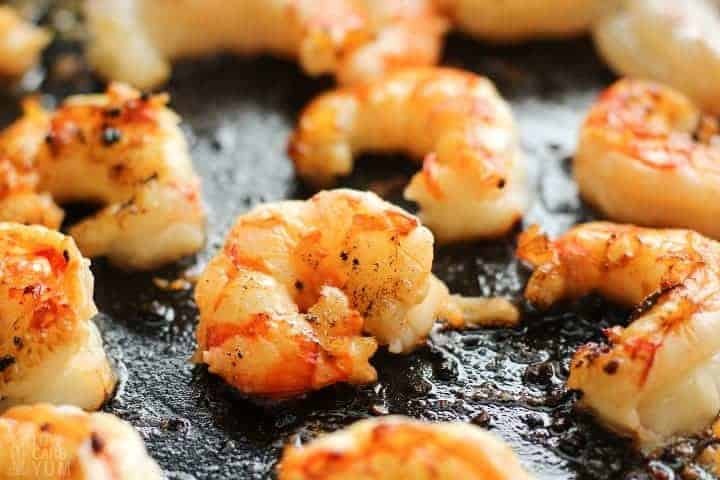 Once the shrimp is cooked, it’s removed from the pan. Next, the remaining butter, water, cream cheese, and parmesan cheese are added to the pan. 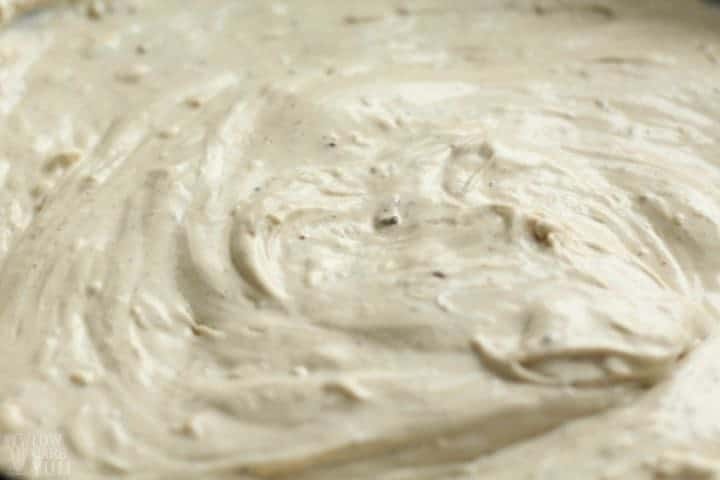 Once the butter and cheese melt into the liquid, a creamy sauce is formed. At this point, the pan is removed from the heat and the shrimp, broccoli, and spaghetti squash are stirred in to complete the dish. 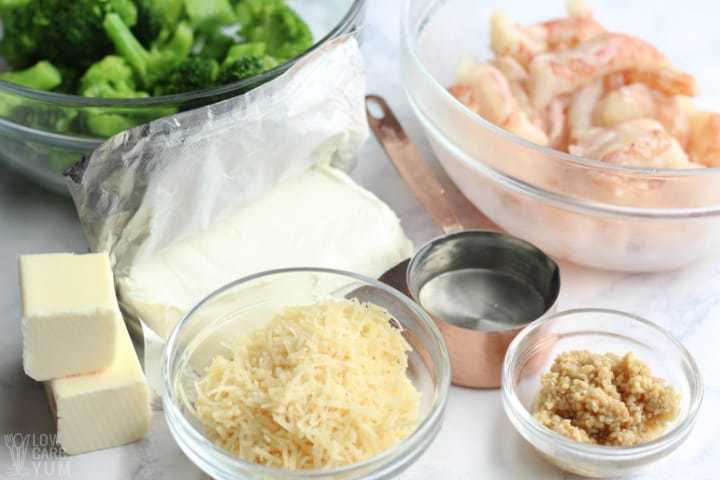 The low carb shrimp Alfredo with broccoli can be served on individual serving plates. But I like to make spaghetti squash Alfredo boats by serving it in the squash shells for a prettier presentation. I like to have extra parmesan cheese to sprinkle on top of the finished dish. And I typically add a tossed salad on the side and some garlic parmesan breadsticks for a restaurant style meal. After a long day of work, this yummy broccoli shrimp spaghetti squash Alfredo really hit the spot. I even had tons of leftovers to enjoy the rest of the week so I didn’t have to cook. It’s easy to change up the dish by swapping out the shrimp for chicken. And the broccoli can be left out or replaced with another low carb vegetable like spinach or kale. Zucchini would also be a good veggie to use when it’s in season. 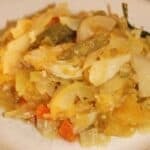 If the vegetable is left out, the color of the dish will be rather bland. So I’d sprinkle some fresh parsley pieces on top. 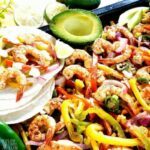 You can also spice up the dish with some Cajun seasoning or add cilantro. 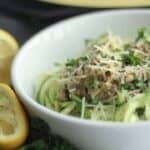 Enjoy this easy and delicious low carb “pasta” dish. And be sure to let us know what you thought of it if you gave the recipe a try. Want more ways to cook up this veggie noodle? 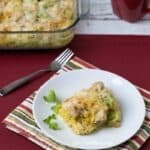 Check out my cheesy broccoli spaghetti squash casserole and my chicken spaghetti squash casserole. 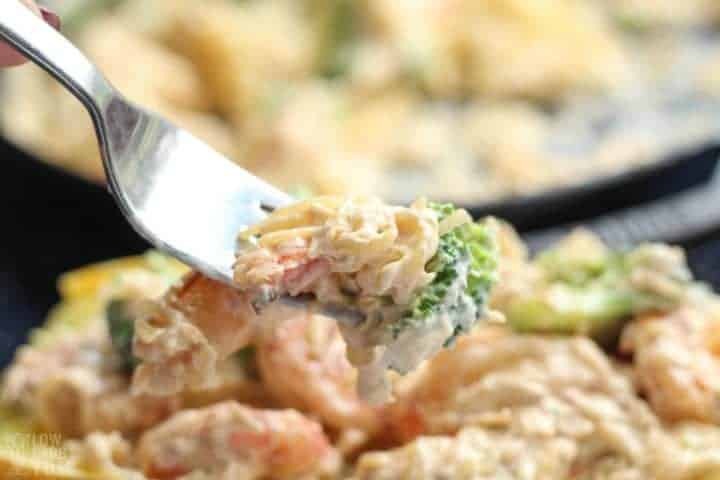 No need to miss pasta on a low carb diet with this tasty broccoli shrimp Alfredo. 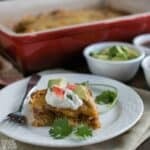 It's made with spaghetti squash noodles. Heat 2 tablespoons of butter in a skillet over medium heat. Add garlic and saute for one minute. Add shrimp and cook for 2-3 minutes on each side, or until pink. 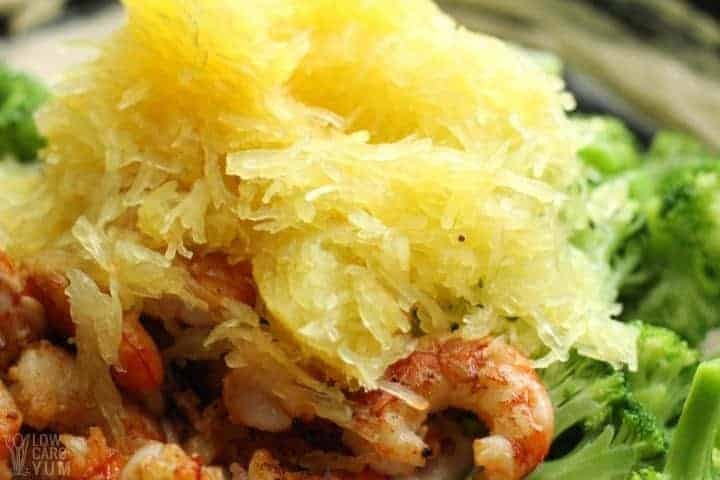 Remove shrimp and keep warm. Add remaining butter, water, cream cheese, and parmesan into pan and stir until well combined. Remove from heat once butter and cream have melted. 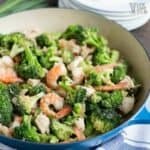 Stir in shrimp and broccoli. For a change of flavor, add in some Cajun seasoning to the shrimp before searing in the pan. The broccoli can be omitted if desired or replaced with another low carb vegetable. Other veggies that can be used include spinach, kale, and zucchini. Garnish the dish with extra parmesan cheese, parsley, and or cilantro. Post updated in December 2018. Originally published April 2016.